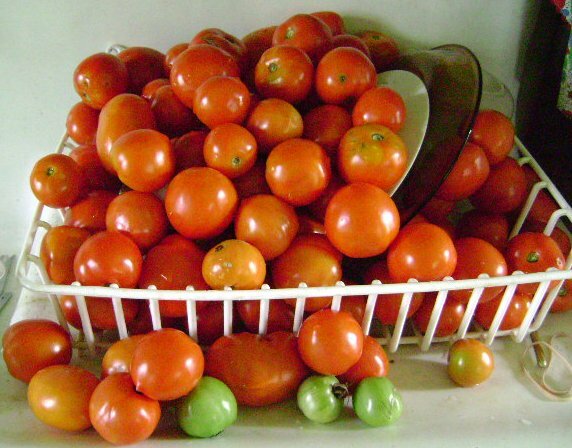 What to do with a sink full of tomatoes? There's tomato sauce of course, and lots of "over-the-sink" tomato sandwiches and Caprese Salad galore, tomato and cucumber salad, gazpacho and plain old sliced ripe tomatoes sprinkled with salt, pepper and basil slivers. Those are all great, but I also just discovered a great way to slice some up 'maters with some other late summer bounty and made a fantastic tasting salad. Mix the vegetables and cilantro together and then dress with the olive oil, vinegar and salt and pepper just before serving. 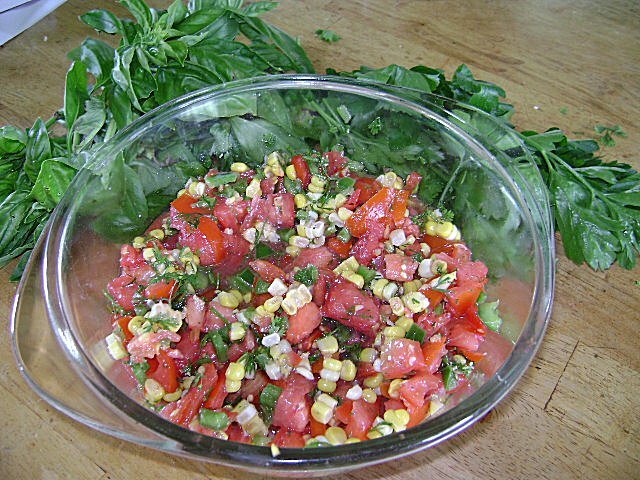 This is a simple, lovely salad that makes its own dressing from the juices that leach out and it is very fresh and vibrant tasting. Best of all, I "shopped" for everything except the dressing ingredients right out of my own garden. It's a simple recipe, but loaded with layers of flavor. I am sending this post on to the Eat Seasonal Food, Fresh event, which ends August 31st. You can see what other seasonal, fresh cooks are making for this blog event at Motions and Emotions.